As we approach the end of the age, we can expect to be living in incredibly difficult times. That’s what God says in 2 Timothy 3 before describing our contemporary culture and the twisted philosophies that are contributing to its decline. 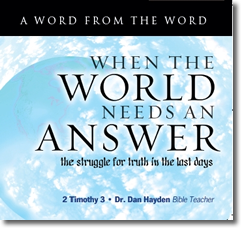 In this series, Dan Hayden shows that God will enable us to minister effectively to the people of the 21st century. He reminds us that the power of God is never the result of mere religious ritual, but it is known by those who seek to live godly lives based upon the careful study of God’s Word.